Yolanda of Crave Cakes asked me to do a Hippie Figurine for a 21st birthday cake. A friend of her daughter was celebrating her 21st with one of Yolanda’s cakes and knowing her well Yolanda sent me the brief and photos of a beautiful blonde young woman with a gorgeous hippie style. 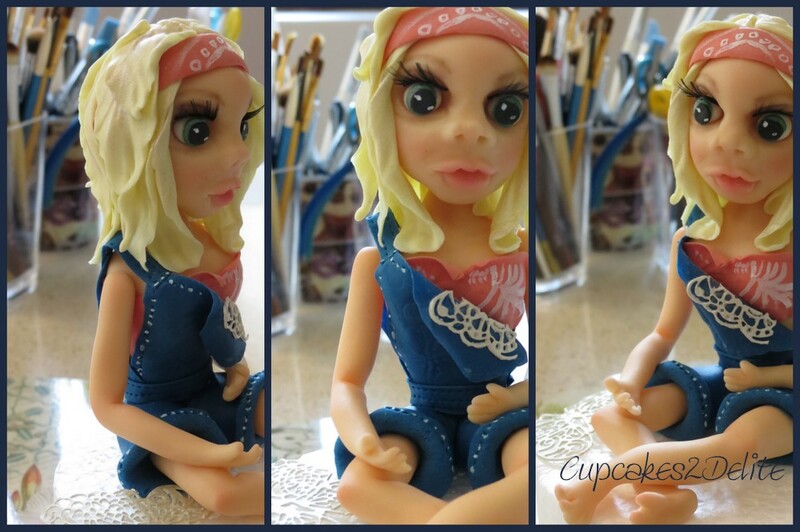 I created this mini sugar figurine in blue stitched denim dungarees to show off long slim legs and a cute printed bandana top as well as a hand painted bandana to hold back her blonde sugar tresses. Beautiful expressive blue eyes, a soft gentle mouth and long lashes finished off this figurine perfectly and I was delighted to see that Yolanda placed her on a gorgeous hippie car cake to complement her style! Just Chillin on my 21st!